Some of them are decongestant that helps clear the air passage and other peripherals like the sinuses. 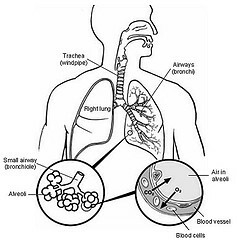 There are many essential oils that can be used in treating respiratory problems. These essential oils have antibacterial properties, such as: Eucalyptus, Peppermint, Frankincense and Lavender are few of essential oils for respiratory problems that may be good when use in blends. Note that essential oils to treat respiratory symptoms on children must be chosen carefully. Remember not to use essential oil components with menthol like peppermint. It has been suspected to cause respiratory collapse or distress on children and must be avoided to prevent complications. Other essential oils for respiratory system are eucalyptus, lemon, atlas cedarwood and sandalwood. Eucalyptus has a powerful vapour that when inhaled helps to ease muscous deposits out of the chest and loosen cough. Lemon is widely used in remedies for coughs, colds and flu. Atlas cedarwood helps to calm breathing, used in vaporizer. Sandalwood can help in dry and mucousy coughs, sore throats and also for treating bronchitis. Aromatherapy and Colds - Aromatherapy and colds, The use of essential oils and other recipes that will make you better. Essential Oils for Chest Congestion - For natural chest congestion relief you can try aromatherapy. Which is the best essential oil for chest congestion? And what methods work the best? Find your answers here. Aromatherapy For Bronchitis - Learn to use aromatherapy for bronchitis relief. Essential Oils for Pneumonia - Essential oils for pneumonia may eventually become a helpful tool for controlling pneumonia infections. Essential oils for asthma - Choosing the right essential oils for asthma treatment can help reduce the symptoms. Find out some tips that that might help you to control your asthma. Swine Flu Preventions with Essential Oils - Precautions along with guide on how the use of essential oils can protect you from the Swine Flu. Essential Oils to Quit Smoking - This page contain details about essential oils to quit smoking and how to stop smoking using aromatherapy blends.